Volcano Fallout: Where's the Tuna and Pineapples? Are E.U. Officials to Blame for Air Travel Chaos? David Leroy, owner of one of London's hottest sushi restaurants, Chisou, is on his last tuna and when that goes he has no way of getting any more. "One of our tuna suppliers just called and said they have no more until flights resume," Leroy says, shaking his head. He's already run out of sea urchin, monkfish liver and scallops. Mike Elgin, one of 54 fish sellers at London's massive Billingsgate fish market, which usually moves nearly 100 tons of fish a day, would love to sell Leroy a tuna  if he had one. "We can't get fish in from all over the world," Elgin says, noting that supplies of tuna, parrot fish, swordfish, kingfish and certain types of dorade have sold out. On the other hand, "Would you like to buy some Scottish salmon?" Elgin asks with a grin. "I've got five pallets sitting outside that were meant for Chicago." Over all, Elgin says, sales are down 10% because of the ash clouds that have grounded all flights to and from England for more than six days now. The economic effects of Iceland's spewing volcano ripple beyond the hundreds of millions a day in lost airline revenues and, according to U.S. Travel Association estimates, the at least $650 million in lost U.S. tourism income. There's no Fedex or United Parcel Service to deliver vital packages and papers. Export/import businesses such as the makers of British cheeses, Scottish whiskies, Paddington Bears and Wellington boots are struggling to deal with backlogged orders. But no industry, outside of the airlines, has been so severely affected by the crisis as the British makers and consumers of perishable goods  especially such delicacies as fresh fish or luxuries as flowers whose life in bloom is just a few hours long. Across London, supplies of exotic produce from figs and pomegranates to anchovies are running out. The fruits and vegetables section in most supermarkets look like a scene out of Dickens, with shoppers whining to clerks, "Please, sir, I want some more." Not that Londoners are starving: the United Kingdom has plenty of lamb and beef, potatoes and carrots. It's just that its people, like so many in this age of globalization, have grown accustomed to oranges and pineapples year round. "The volcano has transported us into a locavore fantasy, forcing us all onto the type of 100-mile diet that used to be imaginable only as a stunt," says Sasha Issenberg, author of The Sushi Economy: Globalization and the Making of a Modern Delicacy. "Over the last generation or so, individual palates and whole cuisines have been reshaped around the expectation that everything is accessible  regardless of where it was harvested, hunted or caught  as long as one is close to an airport and willing to pay for the privilege." Food merchants aren't the only ones suffering. While some of the more than 50 flower traders at the New Covent Garden Market rely mostly on British blossoms, others, such as foliage salesman Barry Porter, have more than 35% of their business airfreighted in from overseas. Porter is lucky that it's late spring in southern Europe  the eucalyptus that he would normally get from Colombia or Israel he's now receiving from Italy and Spain. 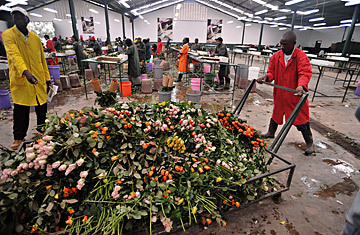 But that means that the roses and carnations that Colombia, Costa Rica, Ecuador, Israel and Kenya are producing right now are literally withering on the stem at the cost to the local producers since, unless a contracted shipment was already en route, the buyers have no responsibility to pay for them. "With a natural product you can't suddenly turn a tap on and supplies are available," says Helen Evans, head of communications for the New Covent Garden Market Authority. "We're not getting minipineapples or banana flowers  those very exotic items they're not going to have." Another trickle-down effect on florists, caterers and grocers is that the limitation on flights has stalled the high-end entertainment market, as hosts and guests alike for gala events have been unable to fly into London. Weddings and movie premieres and expensive company spectacles have been postponed. "Shops servicing corporate clients, corporate parties, big event planners, major weddings  they've been hit pretty badly," Evans says. "A lot of these are small family-run businesses and their margins are extremely small and some were already feeling the impact of the economic downturn. If something isn't done soon  this could get dire."